Although it is evident there was an Ice Age, scientists run into a blank wall when they try to provide the cause. They run into mystery after mystery. 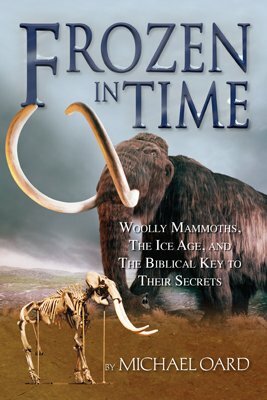 Most scientists believe that woolly mammoths lived during the Ice Age and became extinct near the end of it. To understand what happened to them, we need to understand the Ice Age better. Although it is evident there was an Ice Age, scientists run into a blank wall when they try to provide the cause. They run into mystery after mystery. Figure 3.1. 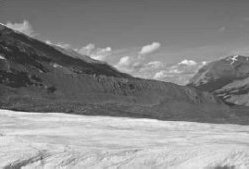 A terminal or end moraine from Athabasca Glacier, Canada. Figure 3.2. A lateral moraine from Athabasca Glacier, Canada. Figure 3.3. A striated boulder in ground moraine from Athabasca Glacier, Canada. Figure 3.4. Striated bedrock from Athabasca Glacier, Canada. Figure 3.5. One of the most distinctive lateral and terminal moraines in the world is in the northern Wallowa Mountains in northeast Oregon. Figure 3.6. The 700-feet-high (210 m) lateral moraine as shown in figure 3.5. Figure 3.7. 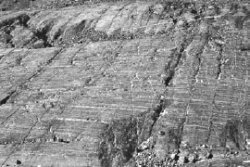 A close-up of the till in the lateral moraine shown in figure 3.6. Looking at the world today, it is hard to imagine that there ever was an Ice Age. It seems inconceivable that ice once covered 30 percent of the land surface of the earth. How do we know there was an Ice Age? Much of the evidence for an Ice Age comes from the study of modern glaciers. Glaciers today leave mounds of debris called moraines. The debris consists of a random assortment of rocks of many sizes within a sand, silt, or even clay matrix. This debris is called till. There are three general types of moraines: (1) A terminal or end moraine is a mound of till that is pushed up in the front of a glacier as it moves forward, (2) A lateral moraine is caused by debris that is swept to the sides of the glacier as it moves, and (3) A ground moraine develops under a glacier. Ground moraine generally has a rough, hummocky look. Within the moraines, we often find scratched or striated rocks. The scratches and grooves are etched on the rocks as rock rubs against rock, or scrapes the bedrock below the glacier. The scratches indicate the direction of the glacier’s movement. We find these same characteristics over large areas on the plains of North America and in the western mountain valleys of the United States as well as parts of Europe, indicating these areas were once covered by glaciers. Clearly, there was an Ice Age. Figure 3.5 displays one of the most distinctive lateral and terminal moraines in the world. It is in the northern Wallowa Mountains of northeast Oregon at about 4,200 feet (1,300 m) above sea level. During the Ice Age, a glacier descended from the Wallowa Mountains north down a valley and out about 2 miles (3 km) onto the small plain near Enterprise, Oregon. The end moraine is rather small, only about 100 feet (30 m) high. The sharp-crested lateral moraines on either side are about 700 feet (210 m) tall near the mountain front. 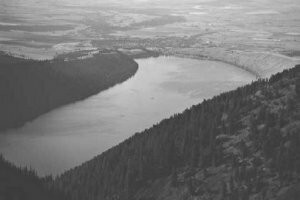 Both moraines form a horseshoe shape that is now occupied by the beautiful Wallowa Lake. The lake occupies an overdeepened valley similar to a fjord. A fjord is a long, narrow arm of the sea along a coast; it once was a coastal valley that has been deepened by a glacier. The terminal and lateral moraines around Wallowa Lake are composed of glacial till, a mixture of rocks of many sizes within a fine-grained matrix. By observing the many signs of glaciation, we can piece together where the ice sheets formed. Two large ice sheets covered North America. One is called the Cordilleran ice sheet. It dominated the western mountains of Canada and the northwestern United States. The other is called the Laurentide ice sheet. It developed over the remainder of Canada and the northern United States (see Figure 3.8). 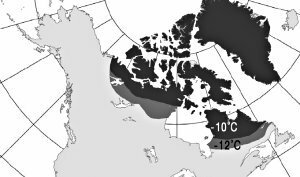 It is still unclear how much of northern Canada was glaciated. An ice-free corridor for the early part of the Ice Age divided the two ice sheets that lay along the east slopes of the Rocky Mountains. In the United States, the southern edge of the ice sheet extended from northwest Washington State through the northern United States. In the Midwest, the edge is thought to have reached as far south as St. Louis, Missouri, at 38°N latitude. The ice possibly did not extend down to St. Louis. The southern deposits could be remnants from glacial lakes and meltwater features that developed along the edge of the ice sheets. Deposits laid by Ice Age rivers and lakes may have obscured the exact ice sheet boundary in areas where there are no distinct terminal moraines. Figure 3.8. North American ice sheets. Many large mountainous areas of the western United States had ice caps. These mountains included large parts of the Rocky Mountains, the Cascades of the Pacific Northwest, and the Sierra Nevada Mountains of California. Ice caps covered many smaller mountain ranges, such as the Wallowa Mountains in northeast Oregon, and even the San Francisco Mountains, south of the Grand Canyon of Arizona. Figure 3.9. The ice sheet in Europe and Asia. Similar signs of an ice sheet are found in northern Europe and northwest Asia. This ice sheet is called the Scandinavian ice sheet. The exact boundaries of this ice sheet in northwest Russia and the shallow ocean north of Norway are still debated.3 Just like in the United States, many of the large mountains of Europe, such as the Alps, Caucasus, and Pyrenees were covered with ice caps. The Ice Age did not occur just in the Northern Hemisphere. It developed on the mountains of the higher latitudes of the Southern Hemisphere. The mountains of Tasmania, New Zealand, Chile, southern Argentina, and even a small mountainous area of southeast Australia were all glaciated. Most of the ice during the Ice Age in the Southern Hemisphere ended up on Antarctica. The current ice masses on Antarctica, as well as Greenland, remain as a testimony to the great Ice Age. The tropics were not left out. A cooler climate caused the ice caps that exist today on the highest mountains to be about 3,000 feet (900 m) lower. The volcanic peaks of east central Africa, including Mounts Kilimanjaro, Kenya, and Ruwenzori, and several of the high peaks in the Sahara Desert had ice caps.4 Ice caps also existed on many other tropical mountains that today do not support glaciers. Just like in middle and high latitudes, these tropical mountain ice caps are inferred from till, moraines, scratched rocks, and striated bedrock. The relative weakness of atmospheric influence is shown up strongly in localities that were glaciated in the Pleistocene but have been free of glacial ice for fifteen to twenty thousand years; in that length of time, the atmosphere has done very little toward erasing the glacial striae, though many a stream has cut a canyon 100 meters or more deep. Striations should be erased rather quickly after exposure. It is unlikely that they would be so distinct after 15,000 to 20,000 years of weathering. How much climate change is required to cause the Ice Age? For an ice age to develop, some winter snow must last throughout the summer and fall, accumulating each year. Therefore, developing an ice sheet or a glacier over mid- and high-latitude continental areas requires a combination of colder summers and more snow. In most of the areas where the ice built up, winters are already cold enough to sustain the snow and ice, but the summers would cause it to melt. As snow continues to build up, it turns to ice by two mechanisms. One is by the partial summer melting of snow that percolates downward and then refreezes, forming ice. The second mechanism occurs after the snow becomes deep enough, possibly up to 200 feet (60 m) deep, in a cold environment. The weight of the snow squeezes most of the air out of the snow at the bottom, basically turning it into ice. This is how the snow becomes ice on top of the Antarctic and Greenland ice sheets. Colder summers and more snow is a tall order. Consider what it would take for an ice sheet to start to develop in Minneapolis, one of the coldest regions in the United States. This area was recently covered by an ice sheet probably around 1,000 feet (300 m) thick not that long ago. The average summer temperature from June through August in Minneapolis is about 70°F (21°C). For the winter snow not to melt, spring, summer and fall temperatures must remain at least below freezing. This means summer temperatures need to cool by at least 38°F (21°C). However, the intensity of the sunshine causes most of the snow to melt; temperature is a smaller, but still important, factor. Since Minneapolis receives plenty of sunshine during the summer, the average temperature would need to be much lower than freezing for even one inch of snow to remain until the next winter. In high-latitude Antarctica, where the sun is low in summer but the daylight lasts for 24 hours, it has been observed that net summer melting along the fringe of the ice sheet occurs at an average temperature of 14°F or -10°C.8 Although the sun angle at Minneapolis is much higher than the fringes of Antarctica, the nights are longer, so the average summer temperature would likely be similar for net summer melting at Minneapolis. A conservative summer temperature average below which at least a little winter snow would not disappear would be 20°F (-7°C). A drop from the average today of 70°F to 20°F is a whopping 50°F (28°C) change in summer temperature! Of course, a lesser temperature drop would be needed in fall and spring because heat from the sun is less and the seasonal temperatures are naturally cooler. The above calculations assumed the same amount of snowfall as in the modern climate. If by some mechanism much more snow fell, then not as much summer cooling would be required to keep an inch or more on the ground. It will be shown later that melting in a dry, cool Ice Age climate (50°F, or 10°C, average summer temperature) near the edge of the ice sheet is about 400 inches (10 m) of ice a year. One inch of ice corresponds to an average of 10 inches of powder snow. So for Minneapolis this would represent 4,000 inches (100 m) of powder snow a year, which is about 100 times their annual average. So, even during a relatively cool summer, the amount of snowfall required is tremendous. Of course, if the average summer temperatures were around 30°F (-1°C), possibly only 20 times the normal snowfall would be necessary. This highly unusual situation would have to continue for many years. What climatic factors would combine to produce a 40°F summer cooling with 20 times the snowfall at Minneapolis for many years? Further complicating the picture, if a mechanism could be found to cause the huge cooling, the atmosphere would have less ability to hold moisture. It would become drier and, therefore, less able to produce the needed snow. This is one of the greatest challenges to any Ice Age theory. Did ice invade the United States from Canada? Another possibility is that the ice sheets actually began in the higher terrain of northeast and western Canada and over the mountains of Scandinavia. These areas continue to support glaciers in the very highest terrain today. Since Canada is closer to the North Pole than Minneapolis, not as much summer cooling and snowfall increase would be needed to develop an ice sheet so far north. Scientists believe the ice sheets grew in these northerly areas and over thousands of years inched their way as far south as Minneapolis or even St. Louis, Missouri, in North America. In this way, the scientists think that the encroaching ice sheet from the north caused the needed climate change for the ice sheet to continue to St. Louis. In Europe, it is suggested that the ice grew over the mountains of Scandinavia and after awhile descended to the lowlands. The ice sheet then continued to grow and inched across the Baltic Sea and into the northern continental part of Europe and northwest Russia. Figure 3.10. Map of Canada showing areas where one inch of snow would still remain from summer melting with temperatures 10 and 12°C (16 and 20°F) cooler than the current summer averages, according to a computer simulation. Is such a vision of the Ice Age possible? Larry Williams9 used a computer simulation to try to answer this question. He wanted to find out how much summer cooling and extra snowfall would be needed to maintain a snow cover through one summer in Canada. To help the ice age start, he doubled the normal winter snowfall and lowered summer temperatures by increments of 3°F (2°C). Williams also raised the land surface 400 feet (120 m), blanked out the influence of Hudson Bay, and decreased the intensity of the summer sunshine a little. All these conditions favor an increased summer snow cover. He checked his results against a glacier in northeast Canada to see if his melting equations were correct. His equations were realistic. As he continued to incrementally reduce the temperature by 3°F (2°C), more of the warm-season precipitation fell as snow instead of rain. In his experiments, he finally developed a permanent snow cover northwest and east of Hudson Bay (figure 3.10). He discovered that average summer temperatures in northeast Canada had to drop to 30°F (-1°C)! This is a summer cooling of 20°F (12°C) from the average of 50°F (10°C) just for one inch of snow to survive in northeast Canada. Williams concluded that it takes much more summer cooling and snowfall than he previously thought to produce a permanent snow cover in northeast Canada. Once again, we are left with the question of what would cause such a drop in temperature and an increase in snowfall? And even if the climate could change to glaciate northeast Canada, what further cooling and greater snowfall would cause the ice to spread south to Minneapolis, Minnesota, or St. Louis, Missouri? Even if it managed to inch south, a drastic climate change for Minneapolis is still essential for such an idea. Similar problems are encountered for northern Europe and northwest Asia, as well as in the Southern Hemisphere and the tropical mountains. 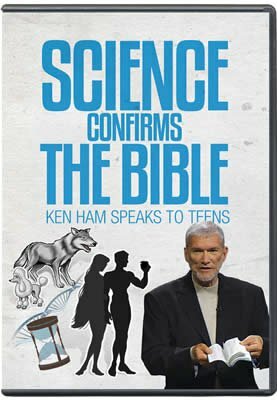 The way some scientists talk, one would get the idea that an ice age can occur easily. Besides the difficulty of an ice age, many other scientists have admitted that the cause of the Ice Age is unknown. An ice age seemed too far-fetched; the climate change was too radical for most minds to accept. However, evidence for glaciation was strong. So, eventually, most scientists swallowed hard and acknowledged the possibility. Isn’t it amazing that after all this time scientists do not know the cause of the Ice Age, which ended not in the remote prehistoric past but recently? Is our climate basically unstable, so that we can be plunged into another ice age soon, wreaking havoc on the nations of the world, as some have suggested? Or was the Ice Age caused by special conditions that are so rare that an ice age will never be repeated? Wet deserts during the Ice Age? Not only is the cause of the Ice Age a major mystery, but also there are a number of other puzzling features associated with this time. Figure 3.11. 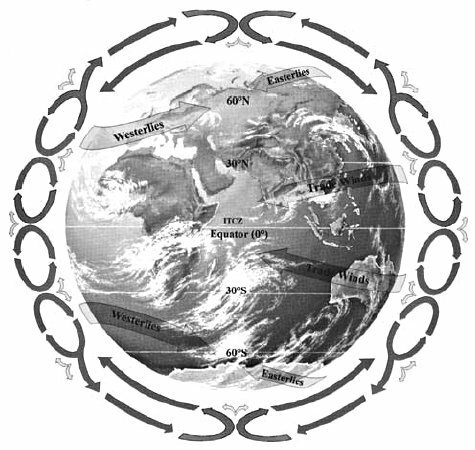 General circulation of the earth’s atmosphere. The downward flowing air at 30° results in drying of the air. View full-size map. Deserts or semi-arid regions are common on the earth today. They are especially abundant around 30°S and 30°N because of the dry circulation of the atmosphere in those belts (see figure 3.11). Scientists studying these arid and semi-arid areas have made an extraordinary discovery. Many were once wet! There is abundant evidence that the Great Basin was once well watered and verdant. Shorelines from lakes are etched high up on the sides of mountains or hills. Some of the shorelines are sharp and barely eroded indicating the lake must have existed for only a short time. Late in the Ice Age, the Great Basin had 120 lakes, some quite large (figure 3.12). 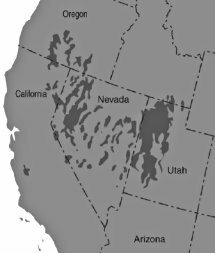 The Great Salt Lake was about six times its current size and 800 feet (240 m) deeper.15 This lake, Lake Bonneville as it is called, was about the size of Lake Michigan. The shorelines of ancient Lake Bonneville show very prominently along the surrounding hills. In northwest Nevada, Lake Lahontan lay in a series of interconnected valleys east of the Sierra Nevada Mountains. It was the size of Lake Erie. Pyramid Lake, Walker Lake, and several other saline lakes are all that is left of once mighty Lake Lahontan. Noticeable shorelines along the sides of Death Valley indicate this very hot basin once possessed a lake about 600 feet (180 m) deep, called Lake Manly.16 A series of lakes in southeast California flowed into Death Valley during the Ice Age. The climate must have been dramatically cooler and wetter during the Ice Age. Figure 3.12. Lakes in the southwestern United States during the Ice Age. Satellites with radar that can penetrate the shallow sand19 have observed an old drainage network in the eastern Sahara. This network consisted of large freshwater lakes and several channels the size of the Nile River Valley. Today, the eastern Sahara Desert receives rain at any locality only once every 30 to 50 years! Large drainage networks have also been sighted in other areas of the Sahara20 and the Middle East. 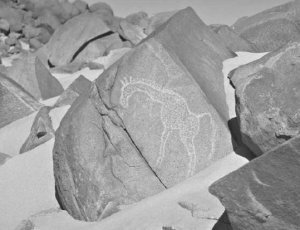 The Sahara is a veritable art gallery of prehistoric paintings. . . . The evidence is enough to show that the Sahara was one of the well-populated areas of the prehistoric world. . . . Yet there is his work, in the most inaccessible corners of the desert, literally thousands of figures of tropical and aquatic animals, enormous herds of cattle, hunters armed with bows and boomerangs, and even “domestic” scenes of women and children and the circular huts in which they lived. The wet Sahara and all the lakes that recently occupied desert areas is another one of the many climatic mysteries surrounding the Ice Age. 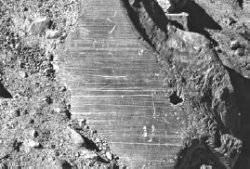 Scientists have speculated that these “pluvial periods,” as they call the past abundant rainfall in desert areas, are associated with interglacials, the warm periods between ice ages. We are supposed to be in such an “interglacial” right now. However, if we are in an interglacial, why are our deserts dry? It makes more sense that pluvial periods occurred during a cooler, wetter ice age than what is currently postulated. Regardless, how are these “wet” deserts to be explained? Ice Age fossils often display a strange mix of animals that would not be expected to coexist. Remains of animals adapted to the cold are found much farther south than expected. Warmth-loving animals are found as fossils much farther north than they would venture today. Yet, they apparently thrived in the Ice Age environment. This peculiar mixture of animals has been given a special name — disharmonious associations. Late Pleistocene communities were characterized by the coexistence of species that today are allopatric [not climatically associated] and presumably ecologically incompatible. . . . Disharmonious associations have been documented for late Pleistocene [Ice Age] floras . . . terrestrial invertebrates . . . lower vertebrates . . . birds . . . and mammals. Finding conditions so favourable the hippopotamus (today an inhabitant of the equatorial regions) had been able to spread northwards throughout most of England and Wales, up to an altitude of 400 meters [1,300 feet] on the now bleak Yorkshire moors. Although paleoecologists often conclude that past climates were equable, it is difficult to create equable climates in continental interiors using climate circulation models. One of the longest-running philosophical debates in paleoecological interpretation concerns the importance of mixed, or disharmonious, assemblages which represent past communities with no modern analog. These mixed assemblages challenge our world view. . . . Mixed assemblages are usually explained by invoking past climates more “equable” than that of today. Indeed, disharmonious associations do challenge the mainstream Ice Age world view. There does not appear to be any likely solution to this enigma on the horizon. It is difficult enough to accept that animals, as well as plants and insects, were disharmonious during the Ice Age. But scientists also are faced with explaining why this mix of animals came to an abrupt end with mass extinctions at the close of the Ice Age — at a time the climate was supposed to be warming and the living area expanding. We must explain the extinction of an animal which was living in great numbers, apparently very prosperously, over a large area, in variable physicogeographical conditions to which it was well adapted, and which died out in a very short time, geologically speaking. One slightly unexpected turn of events has recently occurred. Whereas scientists believed the woolly mammoth became extinct at the very end of the Ice Age, fossils of mammoths have been discovered on Wrangel Island north of Siberia in the Arctic Ocean that have been dated to about 2000 BC by carbon-14.37 So apparently the woolly mammoth managed to survive past the end of the Ice Age on an isolated island. It is possible that the carbon-14 dates are wrong, or that the Ice Age ended around 4,000 years ago. Many of the other animals of the mammoth steppe became extinct or disappeared from whole continents at the same time as the woolly mammoth. In North America alone, 135 species in 33 genera of large mammals disappeared.38 Twenty-two genera of birds went extinct from North America at the end of the Ice Age.39 Other continents were hit hard with extinctions during and soon after the Ice Age, including South America and Australia. In all, 167 genera of large mammals greater than 100 pounds (45 kg) disappeared from entire continents.40 Why? This great extinction — truly a mass extinction — represents one of paleontology’s most fundamental mysteries. Hobbs, H., Origin of the driftless area by subglacial drainage — A new hypothesis, Geological Society of America Special Paper 337, Geological Society of America, Boulder, CO, p. 93–102, 1999. Klassen, R.W., Late Wisconsinan and Holocene history of southwestern Saskatchewan, Canadian Journal of Earth Sciences 31:1822–1837, 1994. Thiede, J., and H.A. 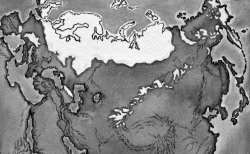 Bauch, The Late Quaternary history of northern Eurasia and the adjacent Arctic Ocean: An introduction to QUEEN, Boreas 28:3–5, 1999. Thiede, J., and J. Mangerud, New map revises extent of last ice sheet over Barents and Kara Seas. Eos 80(42):493–494, 1999. Rosqvist, G., Quaternary glaciations in Africa, Quaternary Science Reviews 9:281–297, 1990. Crickmay, C.H., The hypothesis of unequal activity; in: Theories of landform development, W.N. Melhorn and R.C. Flemal (Eds. ), George Allen & Unwin, London, p. 7, 1975. Wright, G.F., The Ice Age in North America,Bibliotheca Sacra Co., Oberlin, OH, 1911. 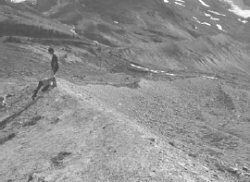 Pickard, J., Comments on “Wastage of the Klutlan ice-cored moraines, Yukon Territory, Canada” by Driscoll (1980), Quaternary Research 22(2):259, 1984. Williams, L.D., An energy balance model of potential glacierization of northern Canada, Arctic and Alpine Research 11:445–456, 1979. Chorley, R.J., A.J. Dunn, and R.P. Beckinsale, The history of the study of landforms or the development of geomorphology — Volume one: Geomorphology before Davis, John Wiley & Sons, New York, p. 213, 232, 1964. Watson, T., What causes ice ages? U.S. News & World Report 123(7):58–60, 1997. Pendick, D., The dust ages, Earth 5(3):22, 1996. Alt, D., Glacial Lake Missoula and its humongous floods, Mountain Press Publishing Company, Missoula, MT, p. 180, 2001. Schmidli, R.J., Weather Extremes,NOAA Technical Memorandum NWS WR-28, U.S. Department of Commerce, Rockville, MD, p. 1, 1991. Smith, G.I., and F.A. Street-Perrott, Pluvial lakes in the Western United States; in: Late-Quaternary environments of the United States, H.E. Wright Jr. (Ed. ), University of Minnesota Press, Minneapolis, MN, p. 190–212, 1983. Hooke, R.L., Lake Manly shorelines in the eastern Mojave Desert, California, Quaternary Research 52:328–336, 1999. Pachur, H.J., and S. Kröpelin, Wadi Howar: Paleoclimatic evidence from an extinct river system in the southeastern Sahara, Science 237:298–300, 1987. Kröpelin, S., and I. Soulié-Märsche, Charophyte remains from Wadi Howar as evidence for deep Mid-Holocene freshwater lakes in the Eastern Sahara of Northwest Sudan, Quaternary Research 36:210–223, 1991. Charlesworth, J.K., The Quaternary era, Edward Arnold, London, p. 1113, 1957. Shaw, B.D., Climate, environment and prehistory in the Sahara, World Archaeology 8(2):133–149, 1976. McCauley, J.F., et al., Subsurface valleys and geoarcheology of the eastern Sahara revealed by shuttle radar, Science 218:1004–1020, 1982. Chorowicz, J., and J. Fabre, Organization of drainage networks from space imagery in the Tanezrouft plateau (Western Sahara): Implications for recent intracratonic deformations, Geomorphology 21:139–151, 1997. Kröpelin, S., and I. Soulié-Märsche, Charophyte remains from Wadi Howar as evidence for deep Mid-Holocene freshwater lakes in the Eastern Sahara of Northwest Sudan, Quaternary Research 36:210–223, 1991. Coulson, D., Preserving Sahara’s prehistoric art, National Geographic 196(3):82–89, 1999. Shaw, B.D., Climate, environment and prehistory in the Sahara, World Archaeology 8(2):142, 1976. Wellard, J., The great Sahara, E.P. Dutton and Co., New York, p. 33–34, 1964. Howorth, H.H., The Mammoth and the flood — An attempt to confront the theory of uniformity with the facts of recent geology, Sampson Low, Marston, Searle, & Rivington, London, 1887; reproduced by The Sourcebook Project, Glen Arm, Maryland. Stuart, A.J., Mammalian extinctions in the Late Pleistocene of northern Eurasia and North America, Review of Biology 66:453–562, 1991. Rensberger, J.M., and A.D. Barnosky, Short-term fluctuations in small mammals of the late Pleistocene from eastern Washington; in: Morphological change in Quaternary mammals of North America,R.A. Martin and A.D. Barnosky (Eds. ), Cambridge University Press, Cambridge, NY, p. 330, 1993. Guthrie, R.D., Mosaics, allelochemics and nutrients — An ecological theory of late Pleistocene megafaunal extinctions; in: Quaternary extinctions: A prehistoric revolution, P.S. Martin and R.G. Klein (Eds. ), University of Arizona Press, Tuscon, AZ, p. 259, 1984. Graham, R.W., and E.L. Lundelius Jr., Coevolutionary disequilibrium and Pleistocene extinctions; in: Quaternary extinctions: A prehistoric revolution, P.S. Martin and R.G. Klein (Eds. ), University of Arizona Press, Tuscon, AZ, p. 237, 1984. Graham, R.W., and E.L. Lundelius Jr., Coevolutionary disequilibrium and Pleistocene extinctions; in: Quaternary extinctions: A prehistoric revolution, P.S. Martin and R.G. Klein (Eds. ), University of Arizona Press, Tuscon, AZ, p. 238, 1984. Nilsson, T., The Pleistocene — Geology and life in the Quaternary ice age, D. Reidel Publishing Co., Boston, MA, p. 223–233, 1983. Sutcliffe, A.J., On the tracks of Ice Age mammals, Harvard University Press, Cambridge, MA, p. 24, 1985. Sutcliffe, A.J., On the tracks of Ice Age mammals, Harvard University Press, Cambridge, MA, p. 120, 1985. Stuart, A.J., Pleistocene vertebrates in the British Isles, Longman, London, p. 52, 1982. Graham and Lundelius, Coevolutionary disequilibrium and Pleistocene extinctions, p. 236. Guthrie, R.D., Late Pleistocene faunal revolution: A new perspective on the extinction debate; in: Megafauna and man — Discovery of America’s heartland, scientific papers, volume 1, The Mammoth Site of Hot Springs, South Dakota, Inc., Hot Springs, SD, p. 45, 1990. Stuart, A.J., Mammalian extinctions in the Late Pleistocene of northern Eurasia and North America, Review of Biology 66:523, 1991. Alroy, J., Putting North America’s end-Pleistocene megafaunal extinction in context; in: Extinctions in near time — Causes, contexts, and consequences, D.E. MacPhee (Ed. ), Kluwar Academic/Plenum Publishers, New York, p. 107, 1999. Cole, K.L., Equable climates, mixed assemblages, and the regression fallacy; in: Late Quaternary environments and deep history: A tribute to Paul S. Martin, D.W. Steadman and J.I. Mead (Eds. ), The Mammoth Site of Hot Springs, South Dakota, Inc., Hot Springs, SD, p. 133, 1995. Tolmachoff, I.P., The carcasses of the mammoth and rhinoceros found in the frozen ground of Siberia, Transactions of the American Philosophical Society 23:65, 1929. Vartanyan, S.L., V.E. Garutt, and A.V. Sher., Holocene dwarf mammoths from Wrangel Island in the Siberian Arctic, Nature 362:337–340, 1993. Lister, A.M., Mammoths in miniature, Nature 362:288–289, 1993. Long, A., A. Sher, and S. Vartanyan, Holocene mammoth dates, Nature 369:364, 1994. Ward, P.D., The call of distant mammoths — Why the Ice Age mammoths disappeared, Springer-Verlag, New York, p. 141, 1997. Monastersky, R., The killing fields — What robbed the Americas of their most charismatic mammals? Science News 156:360, 1999. Grayson, D.K., Pleistocene avifaunas and the overkill hypothesis, Science 195:691–693, 1977. Martin, P.S., and D.W. Steadman, Prehistoric extinctions on islands and continents; in: Extinctions in near time — Causes, contexts, and consequences, D.E. MacPhee (Ed. ), Kluwar Academic/Plenum Publishers, New York, p. 17, 1999. Ward, P.D., The call of distant mammoths — Why the Ice Age mammoths disappeared, Springer-Verlag, New York, p. 120, 1997.